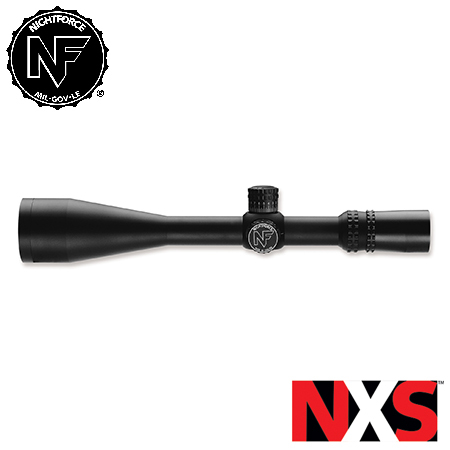 Online ShopHome » Products » Nightforce NXS Family Of Rifle Scopes. Nightforce NXS Family Of Rifle Scopes. The toughest rifle scopes on the planet. Born from Mil-Spec requirements and designed from the ground up, the NXS line of battlefield ready precision rifle scopes stand ready to function flawlessly under the harshest extremes and meet your most demanding needs. The NXS family includes both compact and full size models. The compact models, including the 1-4×24 and 2.5-10x models, are your perfect choice for hunting dangerous game in the bush, running and gunning on a 3-gun course, or while on patrol. 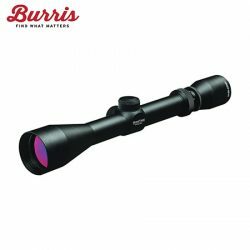 These compact NXS rifle scopes offer the optimum balance between size, weight, and magnification. The NXS full size models continue with the military small arms based 3.5-15×50, our most proven long-range riflescope the 5.5-22×56, and push out to the extreme with the 8-32×56. From the proprietary Mil-Spec bonding agent incorporated in the optical mounting package which ensures no metal to glass contact, to the hardened bronze materials utilized in the adjustment and erector tube assemblies, the Nightforce NXS family of rifle scopes define Rugged, Reliable, Repeatable. Need proof? Watch The Torture Test video and decide for yourself. 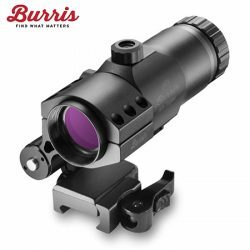 There is a Nightforce NXS rifle scope available for your shooting application. Trusted by world record holders and the tactical community alike, Nightforce NXS rifle scopes are there when every shot counts. The 2.5-10 x 32 NXS has proven extremely popular with hunters, law enforcement officers, our armed forces, and tactical/field shooters. There are only two ways we could improve upon the Nightforce 2.5-10 x 32 NXS Compact…one of their most popular, most proven rifle scopes. 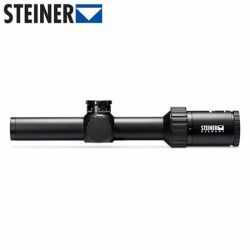 Steiner M5Xi 1-5×24 Rifle Scope.